I honestly believe that the most important ingredient you need when teaching children a new, and difficult skill, is enthusiasm. Without it, the task loses its shine, and becomes daunting, frustrating, scary, or just plain boring. Learning should be fun, at the very least. And the enthusiasm starts with YOU. 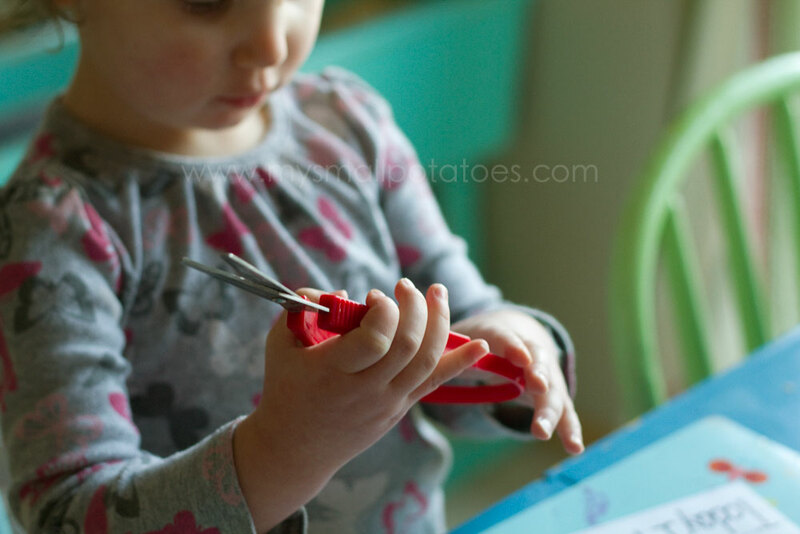 Scissors can be really tricky for little hands. 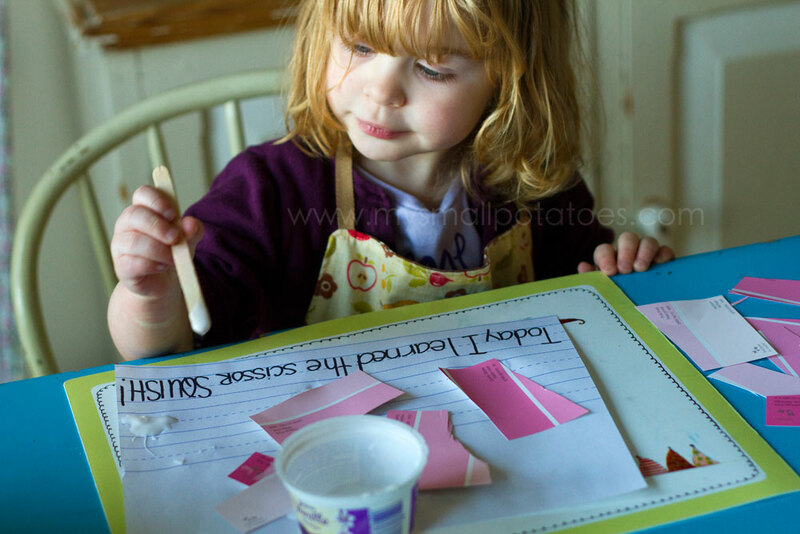 Toddlers are still working everyday on their hand-eye coordination, their gripping skills, and their small-motor abilities. Managing a pair of scissors with one hand, while holding a paper in the other is really tough for them. 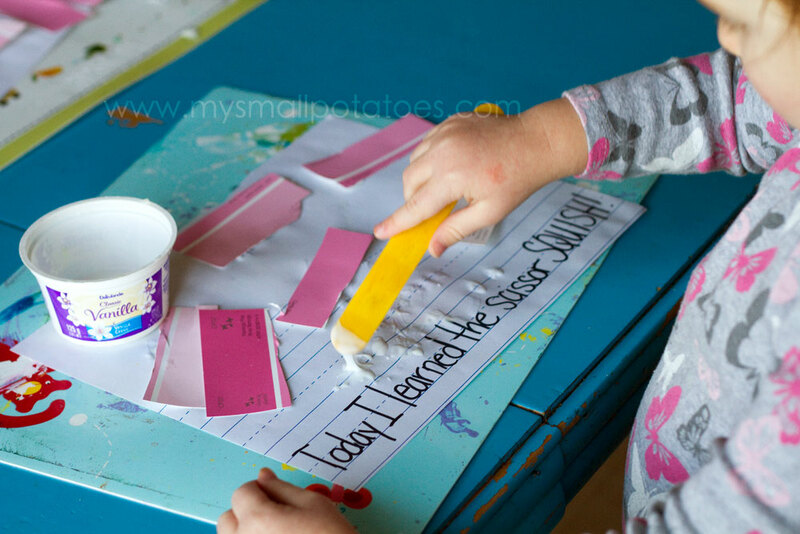 But I don’t think toddlers should be excluded from the joy of cutting things up just because it’s hard, so we use loop scissors. 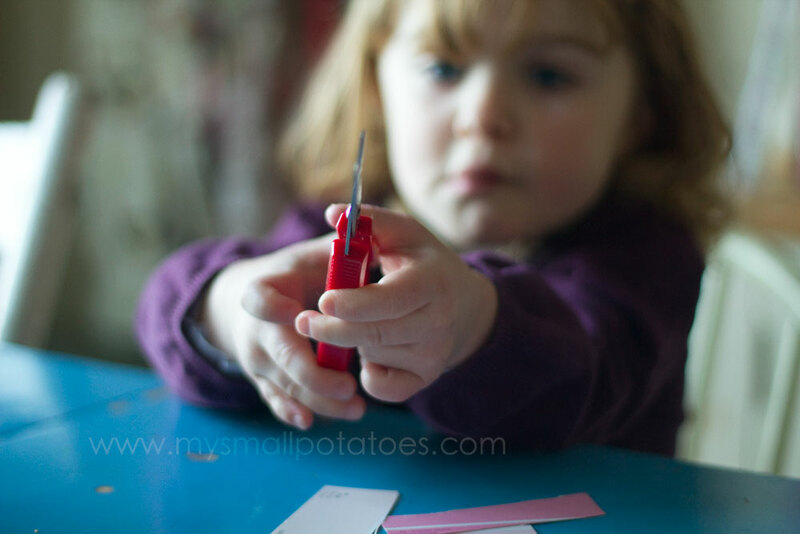 They work on a spring mechanism and if your child can open and shut their fists, they can use the loop scissors. 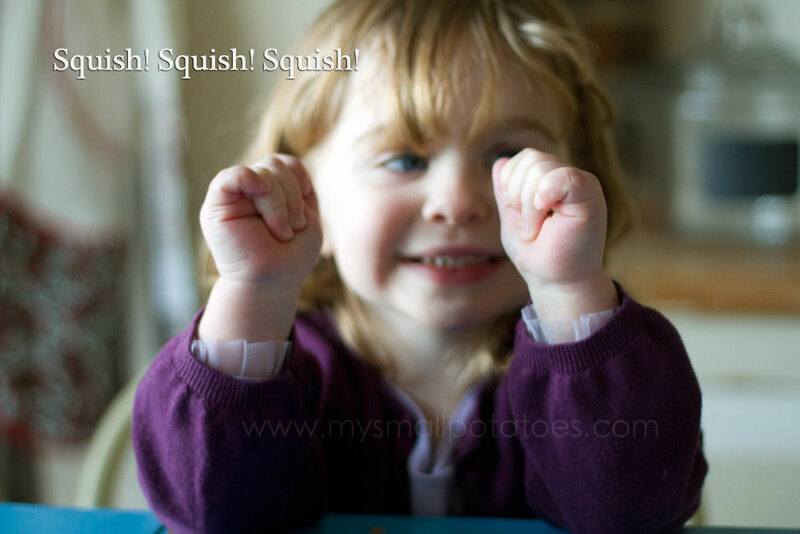 We start by chanting “squish, squish, squish” and opening and closing our fists… Open and shut, open and shut! While their fists are shut, they can squeeze them tight with all their might, all the while shouting and giggling “SQUISH, SQUISH, SQUISH!” It’s really lots of fun…which is what we are aiming for. The minute this activity becomes negative in any way, either stop, or find away to alleviate the problem and continue. 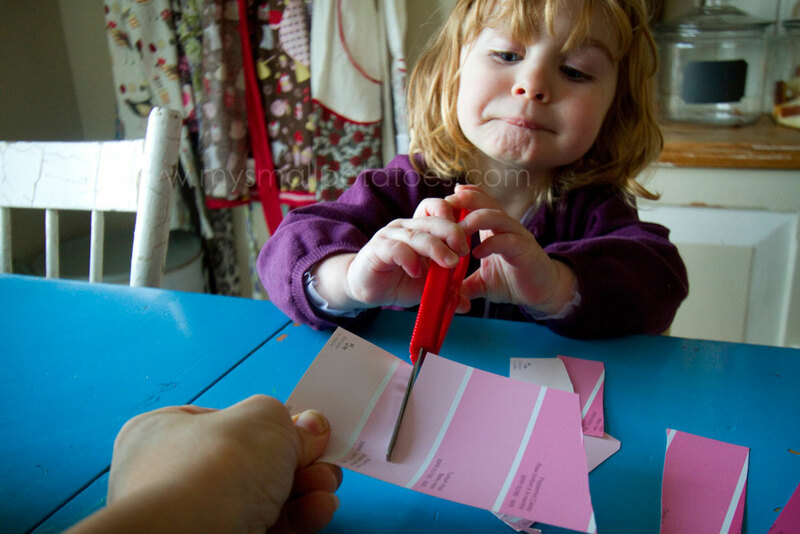 Because Valentine’s Day is right around the corner, we decided to use our cut up paint chips for a gluing project to take home to mommy and daddy… This is also fantastic practice for small-motor skill mastery, and the girls (both 2.5 years old) were so very proud of their work! *The loop scissors can be purchased online here or at your local teacher’s store. If you are in the UK, you may find them online here. Please note that I have not purchased from either of these sites, I bought mine at Scholar’s Choice here in Canada. That’s it – you’re a genius, Arlee!! Scissors with Twos??? Who would’ve ever thought? Thanks to you, they will now! I love sharing your ideas with other child care professionals because 1) you are SO respectful of who children are, and 2) you come up with the most inventive and fun ways to support their developing bodies and minds. Thank you for taking the time to shoot the photos and write/create the posts to share. Keep up the wonderful work! You just made my whole day with your comment, Kathy! Sometimes I wonder if any of this is helping anyone out there. Thank you for taking the time to share your words and thoughts! I think this is a great activity! Thanks for sharing. 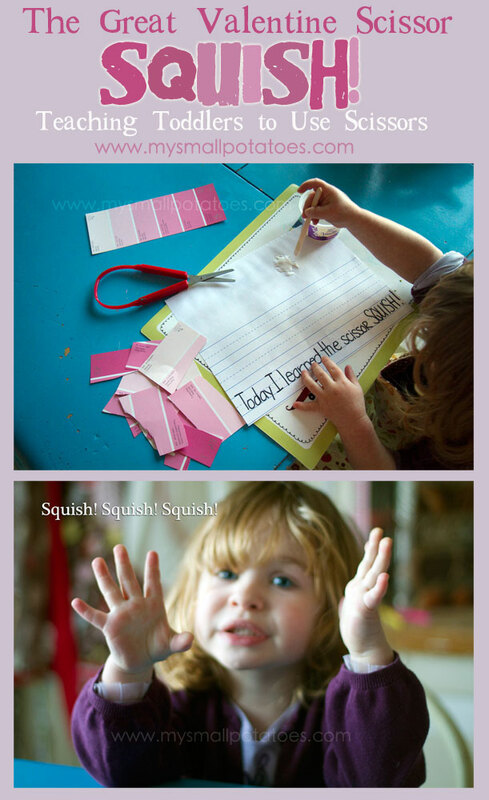 I plan to do this with my toddler soon! I think it’s very important to add here to never throw away those scraps that they have cut up! 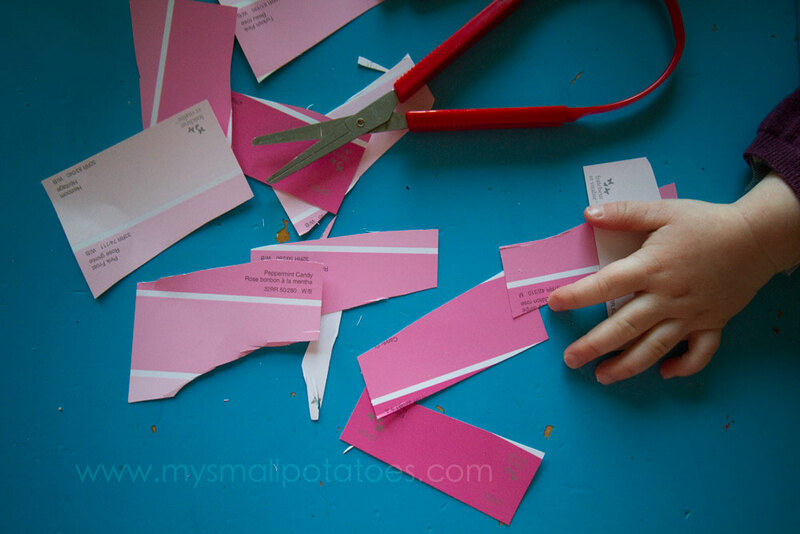 Keep lots of envelopes handy and store those cut bits in the envelopes to take home and show off! Nothing will kill a child’s confidence more than throwing away his work! 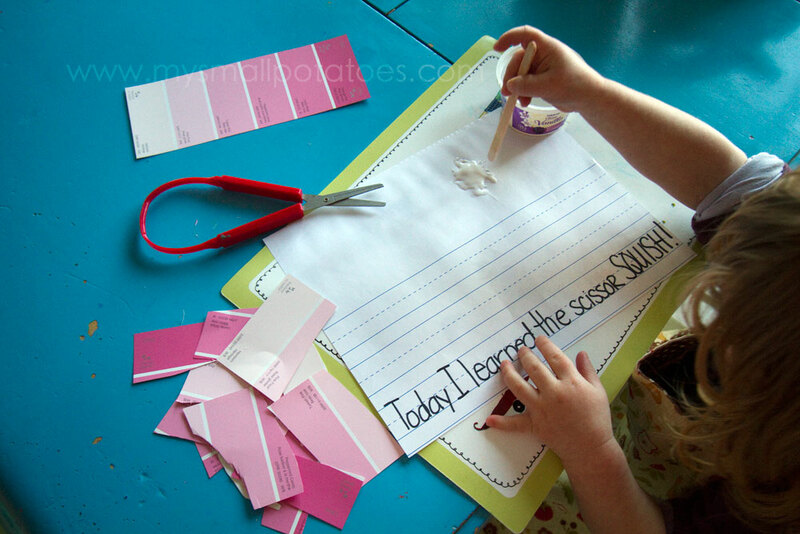 what a simple and yet useful lesson and way to use “found” materials. You can tell you are a really great preschool teacher. Some people were just born to teach kids!